As a former Girl Scout, I probably know more about the basic foundations for building a business from trying to sell cookies than I do from all my years of formal education. 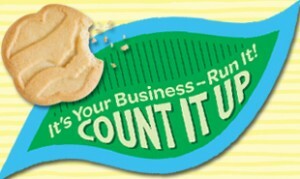 While the cookie sales are the biggest fundraiser of the year for the Girl Scouts, the lessons are so much more than just “What do they put in the Thin Mints to make them so addicting?” Trying to sell cookies during the peak of New Year’s resolution time are the foundation of being an entrepreneur. 1. Fun is contagious. There is nothing less exciting to a 10 year old girl than sitting in a cold, metal chair outside of a grocery store on a Saturday afternoon in January, trying to sell cookies to random strangers who just left the gym. As a Brownie, I dreaded it every single time. Well, until my grandfather did it with us one day. He taught us one-liners to share with people as they walked past. He helped us make up silly songs to pass the time. He taught us that the chicken dance is guaranteed to make people smile. (Don’t believe me? Try it the next time you’re talking to someone.) In turn, not only did the time pass more quickly because we were having fun, but people were far more receptive and willing to stop at our table. Even if they passed on the cookies, they left with a smile. Anyone who knows me know that, to this day, I enjoy making other people smile and laugh. 2. Networking is more than just passing out a flyer or shaking a hand. So many parents today simply take their daughter’s flyer to work and ask co-workers to purchase the cookies. While I understand we are all busy, by doing so, parents are robbing their girls of valuable experience in reaching out to others. Networking is essentially tapping into the relationships we have and using them to promote our product. By building relationships, girls are learning to deliver a clear, concise message, learning to speak up for themselves and building self-confidence, all of which are invaluable skills as they enter their chosen career field later in life. Networking forces girls to get creative and think of new ways to reach out to their community. 3. Don’t take it personally. While I was disappointed when someone declined my offer to sell them the most addicting cookies on the planet (Thin Mints, people. Seriously. ), I learned that everyone had a reason for buying/not buying a product. Did it mean my product was crap? Hardly. Maybe they were allergic. Maybe they bought twelve boxes from their neighbor right before I asked. Maybe they didn’t have any extra money that week. Whether they bought cookies or not, I smiled and said, “Have a great day.” What seemed like such a simple idea at the time prepared me for a successful career in sales many years later by developing a thick skin. 4. Change is inevitable. When I was a Junior Girl Scout, cookie prices were $2.00 per box. People complained when prices went up to $2.75 per box, but they still bought them. Flavors changed every year, as did names of cookies. (Both of which are still changing, 30 years later fyi.) People complained when their favorite cookie was discontinued, but they bought other flavors. Rather than allow customers to focus on the negative, I had to find new ways to market the cookies. Change forced me to find a positive spin on customers’ complaints. As in life, we adapted and rolled with the punches. I don’t think I could have survived my teenage years without learning to be resilient early in life. 5. Goals are a good thing. 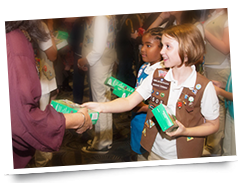 Each year before a single cookie was sold, we set our sales goals both as individuals and as a troop. We devised a plan of attack and executed that plan. Did we meet it every year? Of course not, but it wasn’t for a lack of effort. We had a deadline to meet and we worked our behinds off to meet that deadline. What do all successful entrepreneurs have in common? They set goals and create action plans to meet those goals.